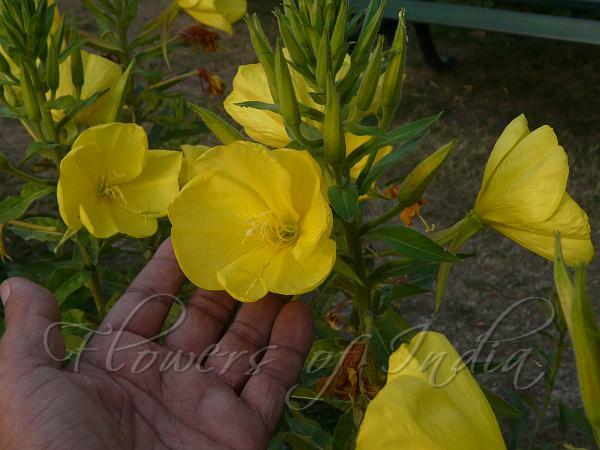 Large-Flower Evening Primrose is usually a biennial plant, forming a rosette, erect, with simple or much-branched main stem, up to a meter tall. 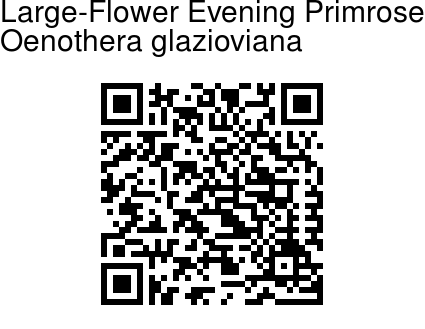 Flowers are borne in simple or branched clusters. Floral tube is 3.5-5 cm long. Sepals 2.8-4.2 cm long, red-striped along the midrib; sepal tips 5-8 mm long, spreading. Petals yellow, broadly obheart-shaped, 3.5-5 cm long. Style 5-8 cm long, the stigma held above the anthers at bloom. Plants are bristly and coarsely erect hairy, some to many of the hairs with a reddish-purple pustulate base, the inflorescence mixed hairy and glandular-velvet-hairy. Rosette leaves are narrowly lanceshaped to inverted-lanceshaped, 13-30 x 3-5 cm; stem leaves narrowly elliptic to lanceshaped, narrowed to the leaf-stalk, the uppermost stalkless, 5-12 x 2.5-4 cm, bracts lanceshaped to narrowly ovate, 1-3 x 0.7-3.2 cm; all leaves wavy at the margins and sinuate-toothed to minutely toothed, sometimes reddish along the midrib. Capsule narrowly lanceshaped in outline, 2-3 x 0.5-0.6 cm, green with a red median stripe on each valve, and with reddish-purple pustulate based hairs. It is a fertile hybrid originating in Europe. Identification credit: J.M. Garg, Gurcharan Singh Photographed in Chayal, Himachal Pradesh & Srinagar, Kashmir.